In many Asian countries, before building a build or placing some furniture, they used special way to guidelines. It's named Feng Shui, Although practiced in many Asian countries, but it is becoming increasingly popular in Western cultures. This is a set of ancient Chinese guidelines for properly placing objects and buildings. Feng shui states that all objects have energy that is positive or negative, so care should be taken to balance these energies. Chinese inspired interiors display bold colors along with ornate furniture and accessories. The furniture pieces tend to be carved wooden designs with hand-painted details and high-gloss lacquered surfaces. Accessories continue this dramatic style by featuring animal motifs and mythological beasts, such as monkeys and dragons. Porcelain ginger jars, large vases, and fish pots painted with complex patterns in multiple colors or in classic blue and white are also fashionable in Chinese interiors. Other stylish items frequently seen are large wall murals, plaques, and folding screens which depict historical characters and legendary scenes in vibrant or striking color palettes. 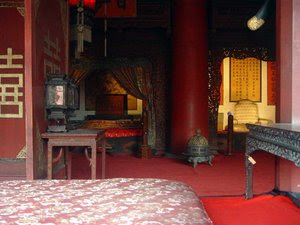 Red is a prominent color in this Asian style interior design, perhaps because it means good luck in Chinese culture. Other bright colors such as yellow and green are used as accents as well. Colorful paper lanterns are often made in very vibrant colors. Wood tones tend to be dark and rich in color. Chinoiserie is an art form where furniture and accessories are patterned after the detailed embellishments and complex decoration of Chinese designs. While Chinoiserie is very much sought after today, it was originally popular in mid-1800’s Europe. This Chinese influence can also be seen in the architectural style used in many pavilions and garden pagodas.